This episode of Investing in Real Estate is sponsored by Vistaprint. With Vistaprint, you can create a truly professional, unique business card in minutes. Vistaprint is offering you 500 high-quality, custom business cards starting at $9.99. Visit Vistaprint.com and use code INVESTING. If you want to build a passive income through buy and hold real estate, you’ll have to understand the basic principles of supply and demand. This basic knowledge will help you to select a viable rental market, find tenants, and gain an income. 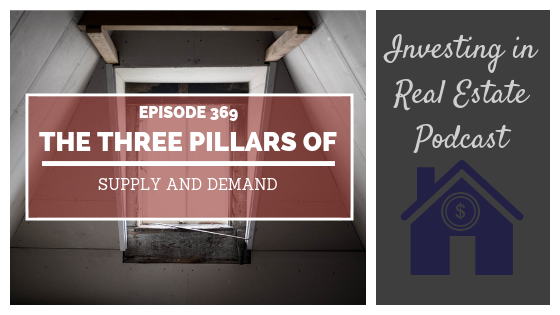 On this episode of Investing in Real Estate, I’m sharing the three pillars of supply and demand. You’ll learn basic definitions, clear examples, and why supply and demand is so important for real estate investing. You won’t want to miss episode 369! What kinds of employers to look for in a rental market. The importance of American-based infrastructure. Examples of good rental markets. The types of neighborhoods that retain population.